Gucci "Regina" metallic leather sandal with pearly studs. For in-store inquiries, use sku #2380066. 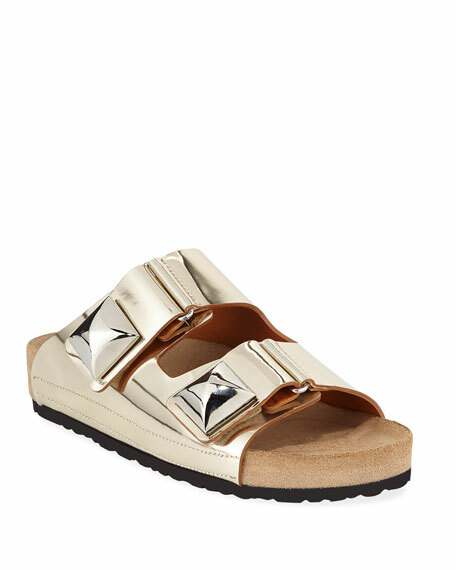 Robert Clergerie metallic fabric sandals with leather trim. 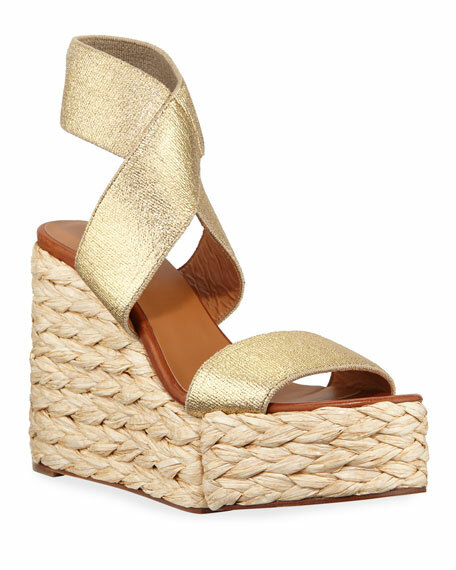 4.3" woven raffia wedge heel with platform. Wide strap bands open toe. Stretch ankle cuff. Leather lining. Smooth outsole. "Aurore" is made in Spain. Fendi strappy sandals in metallic calf leather. 0.3" flat heel. Layered straps cross open toe. Logo tab at padded heel counter. Adjustable ankle-wrap strap. Leather lining and sole. "Colibri" is made in Italy. Giambattista Valli metallic leather sandal with stud accents. 1" flat heel. Open toe. Dual grip-strap upper. Molded suede footbed. Rubber outsole. Made in Italy.